Some other parts of the former parish of St Birinus, Calcot were combined with the adjoining parishes of St.Matthew’s and St.Michael’s. See Our Parish for details on the historical changes to the Parish Boundary. The St Birinus Church building is now owned by ‘The Gate’ church (formally Reading Community Church) and is now known as ‘The Gate : Empress Road’. See http://StBirinus-Calcot.org.uk for further details. 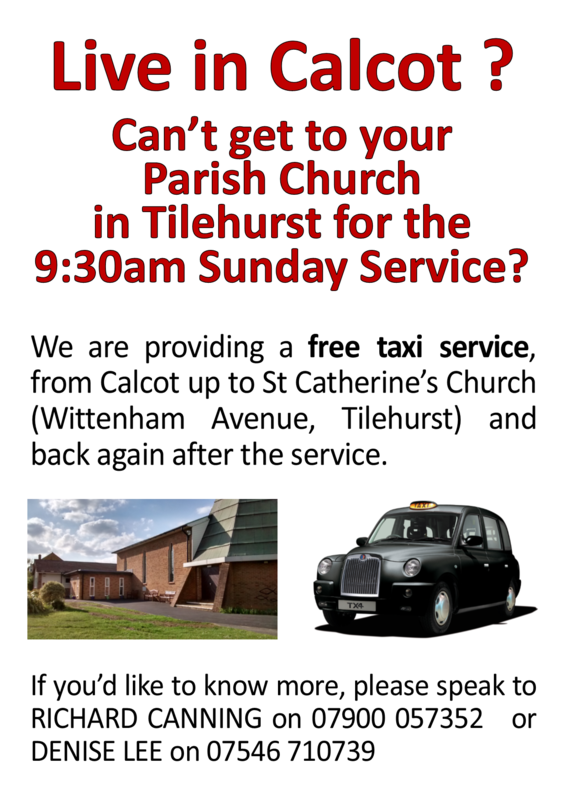 To help people from Calcot get up the hill to worship at St Catherine’s, we provide a Taxi service. Click on the flyer below for details.